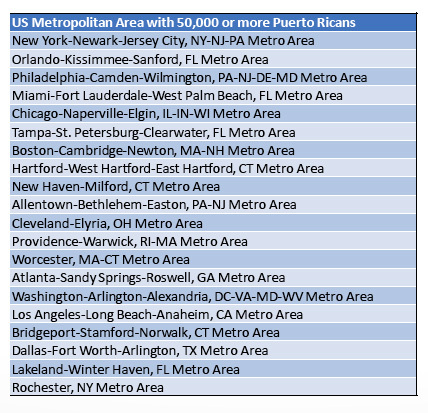 Primary U.S. metropolitan areas that will be impacted. Twenty major metropolitan areas with 50,000 or more Hispanics of Puerto Rican origin will likely absorb the influx of climate refugees from the island, according to a study released by research firm Eureka Facts on Sunday. These cities will need to prepare for new residents who have full U.S. citizenship but several unique characteristics that differentiate them from the general U.S. population and other Hispanics, the study confirmed. Cities including New York City, Orlando, Philadelphia, Miami and even Cleveland will likely start seeing new residents arrive just as quickly as transportation infrastructure is restored. In addition to the 20 large jurisdictions, there are 30 other locales such as Buffalo, Phoenix and Charlotte with 10,000-50,000 people who identify as Puerto Rican. The devastation in infrastructure in Puerto Rico has resulted in loss of inhabitable dwellings, places of employment and community resources such as schools, hospitals, the power grid and other essential services. While Puerto Ricans are a “resilient people,” the magnitude is such that even small fractions of the 3.4 million population are expected to seek refuge near relatives and friends in mainland US. Cities need to prepare to receive these new residents. “Displaced from their homes, they will need support in housing, health, employment, in learning their new community, enrollment in schools and in accessing a variety of social services”, says Jorge Restrepo, CEO and Principal Analyst at EurekaFacts. Home ownership is much lower in the island than in the continental U.S., which makes Puerto Ricans more mobile than the average American. Nearly three quarters (73 percent) lived in single-family homes, while half of mainland Puerto Ricans live in apartments. Mainland Puerto Ricans tend to be highly educated and among the most affluent among Latinos. However, they will need the full assistance typical of anyone displaced from their home and community to get back on their feet. Two thirds of Puerto Rican islanders speak Spanish only at home, while only 6 percent to 20 percent of mainland Puerto Ricans do. Bilingual services will be important as well. EurekaFacts compiled these demographics along with the list of 20 primary and 30 secondary cities using its proprietary Segmentos geo-demographic tool. The tool enables organizations to discover and focus on their target audience and integrate detailed profiles of the Hispanic population into their data sets. To view the full list of cities expected to receive Puerto Rican Hurricane María migrants visit www.EurekaFacts.com/puertorico. Related tags : Hurricane MariamigrantsPuerto RicoU.S. Only FEMA camps can handle stage one of massive migration of a million or more. Northern U.S. cities with such space can work for several summer months; but up North winters will be very tough for folks from the tropics without suitable heat and protection from cold. Finding employment without language and skill barriers will be very hard to arrange, but in small groups many small towns can be possible, but certainly far from all. Hey Buddy!, I found this information for you: "Study: 20 U.S. cities to receive ‘brunt’ of PR migrants". Here is the website link: https://newsismybusiness.com/cities-receive-migrants/. Thank you.